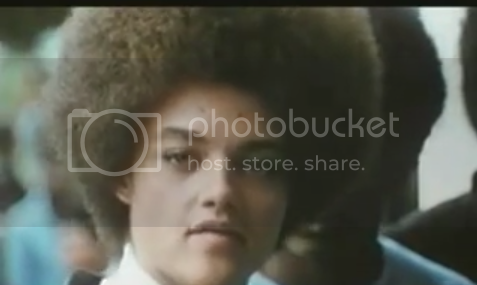 Kathleen Cleaver, now a law professor, was once married to Black Panther Eldridge Cleaver. At the height of the Black Panther Party's visibility, Kathleen became recognizable for her striking red afro and knee-high boots. This brother here, myself and all of us were born with our hair like this, and we just wear it like this because it's natural. The reason for it, you might say, is like a new awareness among Black people that their own natural physical appearance is beautiful and is pleasing to them. For so many years, we were told that only white people were beautiful--that only straight hair, light eyes, light skin was beautiful so Black women would try everything they could -- straighten their hair, lighten their skin--- to look as much like white women. This has changed because black people are aware. White people are aware of it too because white people now want natural wigs like this. Dig it. Isn't it beautiful? Alright.